The beginning of this year was fairly full on in our house. Exhausted, yet with much partying to be done, something had to give. There were a few more take aways, leftovers began taking up permanent residence in the fridge and the cupboards seemed to be filling up with food that I couldn't find the time to cook. The nap-avoiding Baby R had reverted to newborn sleeping patterns and I was bumbling from day to day on a few hours broken sleep (and gin, always gin). When we finally surfaced some time in late February the kitchen cupboards were fit to burst. Leftovers from catering for my birthday tea party, tins that had just kept arriving in the weekly shop, half packets of five different types of rice. Ridiculous really for someone who usually uses up every last scrap of leftovers. So I set about cooking and eating the cupboards. Family meals created to use up all of those odds and ends of pulses, grains, frozen scraps of fish, limp herbs and vegetables way past their best. It's quite a cathartic process - stripping everything back, being creative and avoiding waste (before starting all over again). A handful of the more photogenic meals made it onto my instagram feed under the hashtags #cookingthecupboards and #eatingthecupboards. Returning from my (all too brief) trip to visit my sister in Vietnam and back in my kitchen this week I found some sad looking leeks which I'd ordered from Farmdrop before I left, a handful of leftover Jersey Royals and that packet of Rude Health sprouted spelt flour which has been slowly creeping to the top of the cooking the cupboards list (slowly, simply on account of the fact it hadn't yet been opened and therefore could wait patiently a little longer…). Galettes are a great starting point if you're new to baking tarts or quiches. No careful precision or blind baking required. Simple and rustic (or rough and ready, whichever way you look at it). 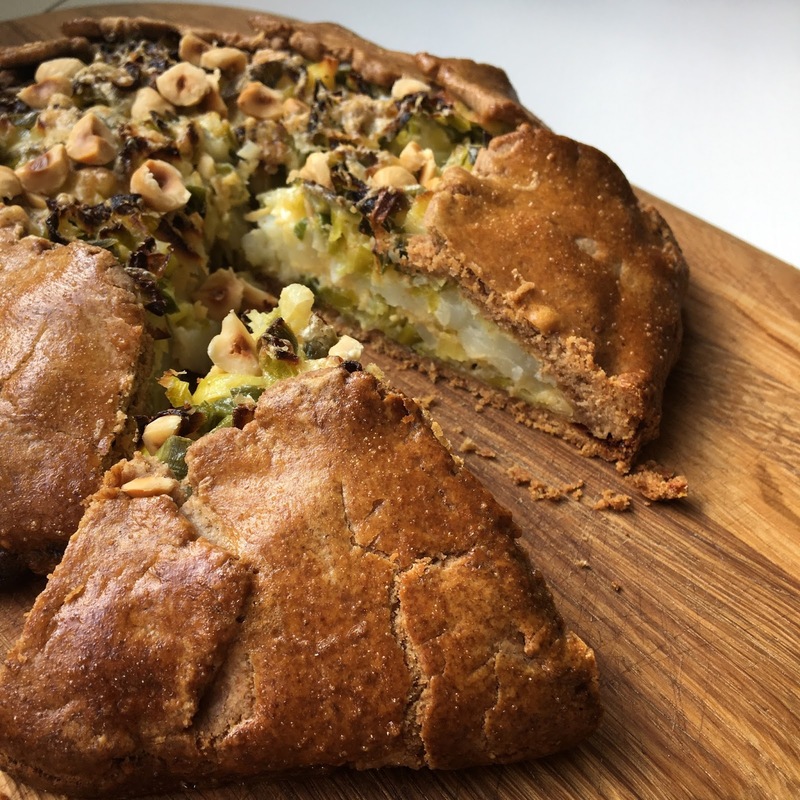 I usually bake sweet galettes, so this recipe is my first foray into the savoury sort. They are relatively quick to make and bake too, making them a good option for family meals, packed lunches or weekend picnics. Jersey Royals really are the kings of the potato world. Their distinctive flavour works so well in this tart, but if you can't get them they can be substituted with other new potatoes. The best Jersey Royals to buy are the ones still covered in mud and soil which protects them in transit. Just wash gently to help keep their papery skins intact. The sprouted spelt flour from Rude Health is delicious in this pastry and combined with the roasted hazelnuts gives the pastry an intense, rich nutty flavour. And it's also really good for you. It is more expensive than normal spelt (or other flour) though, but definitely worth trying. If you'd rather stick with what is already in your cupboards, rather than buy more ingredients, then you can replace the 160g with standard plain flour or spelt flour, but I'd opt for wholegrain (or a mixture) rather than all white. Put the hazelnuts on a small baking tray and roast for 7-8 minutes until golden. Leave to cool completely then put them into a food processor or blender and pulse until finely ground. Put the flour, salt (if using) and butter in a mixing bowl and rub together with your finger tips until they resemble breadcrumbs. Stir through the ground hazelnuts. Add the cold water, a little at a time, and bring together to form a ball, handling the pastry lightly and as little as possible. Flatten into a patty, wrap in cling film and chill in the fridge for 30 minutes. Slice the leeks into 5mm rounds and wash thoroughly in several changes of water. Heat a frying pan over a medium heat, add the oil and then the leeks. Cook for 5 minutes, stirring often, until the leeks are soft but still have a little bite. Put to one side to cool. In a small bowl beat together one egg, double cream, mustard, black pepper and salt (if using). Stir in the cooled leeks. Line a large baking sheet with non-stick baking parchment or a silicone liner. Roll the pastry out until it is about 3mm thick and lay it on the baking sheet. If you're using the sprouted spelt flour you may find that it is a little tricky to roll out as it can be quite fragile. Any little cracks can be squished back together - so long as there are no big holes or cracks for the filling to leak through you're winning. Scatter the grated cheddar onto the pastry, leaving a 4-5 cm gap all the way around the edge. Spread half of the leek mixture over the top of the cheese, followed by a layer of sliced potatoes and finish with the rest of the leek mixture. Top with the grated parmesan (or vegetarian equivalent). Carefully fold the edges of the pastry over the filling, making little tucks where needed and plugging any little tears or holes as you go. Brush the pastry with the beaten egg. Bake for 35 to 40 minutes, until the pastry is cooked. Transfer to a wire rack. Sprinkle with the chopped toasted hazelnuts and serve hot, cold or at room temperature. 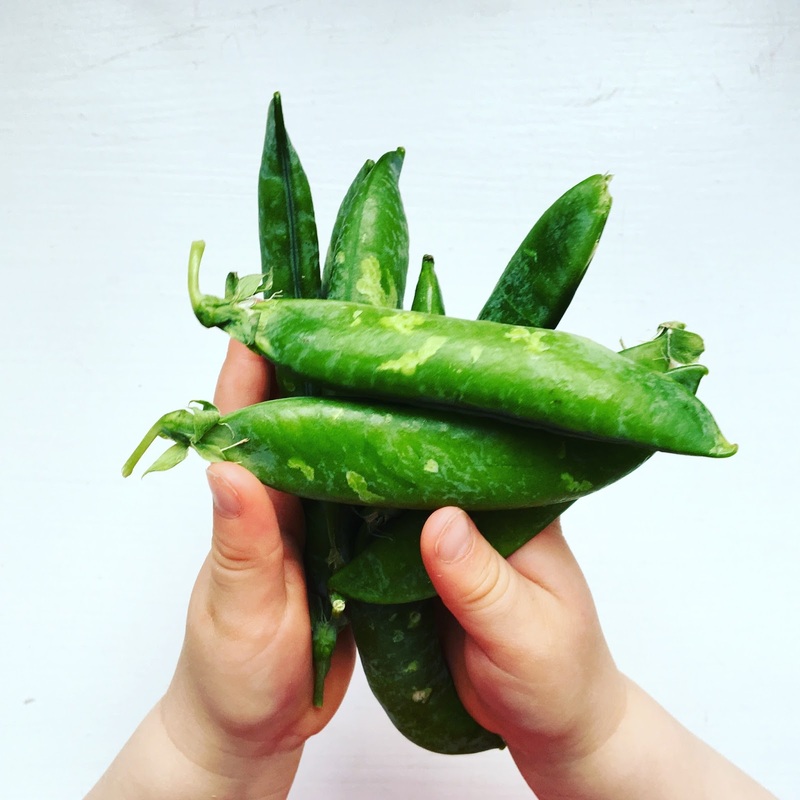 Each year, as the vibrant green, pungent leaves start creeping onto menus and into recipes, I wonder why I didn't take my friend Danny up on his offer last year (and the year before, and the year before that…) of a clump of wild garlic from the bountiful supply in his garden. He's a dealer you see. If you need to get your hands on any of the green stuff, he's your man. But alas, I failed and my garden is ransom-free. I could take myself off foraging. I really could. Although that would probably involve levels of organisation which are a little beyond my abilities during the Easter holidays when my days are filled with giant cardboard structures, never ending stories of monstrous monsters made of slime, my 5 year old's new found love for knock knock jokes, dens, mud, sticks and endless cries of "book, now". My first stash of the season came courtesy of Tim at Franklins Farmshop. I took it swimming with me. The aroma filling the changing room after half an hour in the pool may have gained me a few strange glances. Then Farmdrop came up trumps with the bounty, along with some other quite simply stunning vegetables and salads. Farmdrop describes itself as being a bit like an online farmers market. A place where you can get delicious food and meet the local producers behind it. 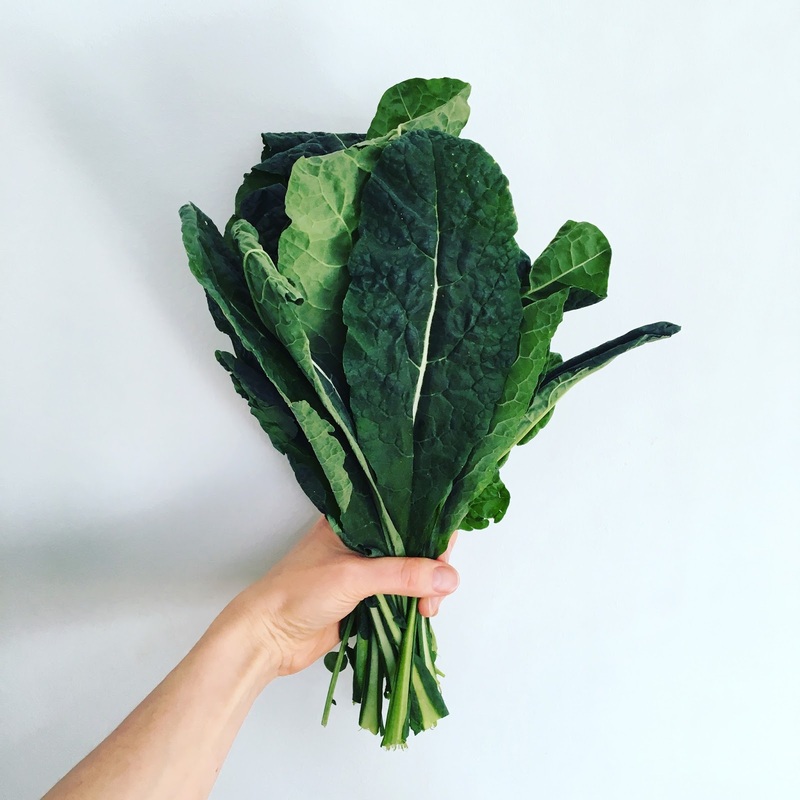 Farmdrop works in a different way to other online shops - rather than harvesting what is available and then selling it, the producers harvest, bake, catch once they have received your order. The result is fresher produce for you and no waste for them. Win win. 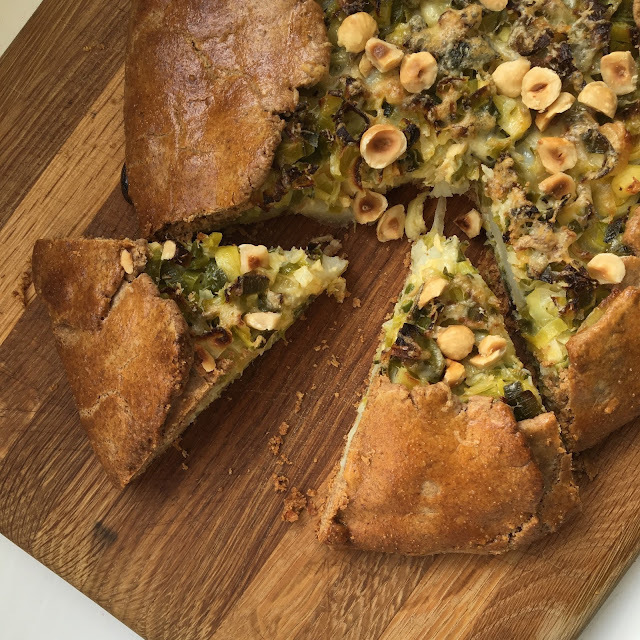 So, what to make once you get your mitts on some wild garlic? Well first up, I always replenish my stocks of wild garlic pesto and wild garlic oil (they keep brilliantly in the freezer). I also have my sights set on Fleur Bell's wild garlic & cheese scones which she baked for our last Band of Bakers event, seriously moreish. 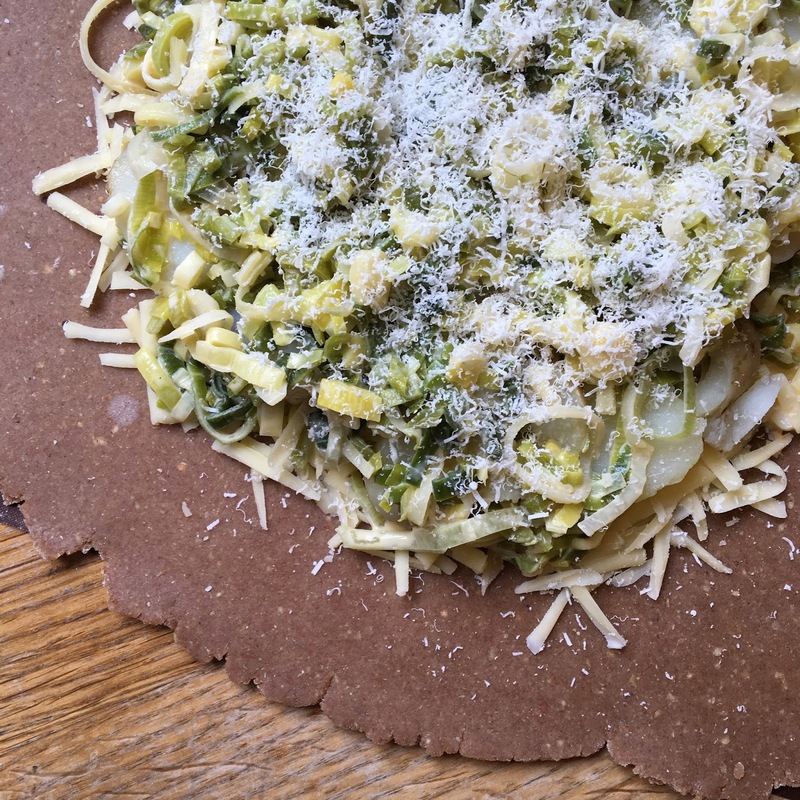 But what I'm making lots of right now, are these wild garlic socca. Socca (or farinata) is a protein rich pancake made from chickpea flour. Naturally gluten free and dairy free its a great recipe to have up your sleeve if you are catering for anyone with food allergies or intolerances. 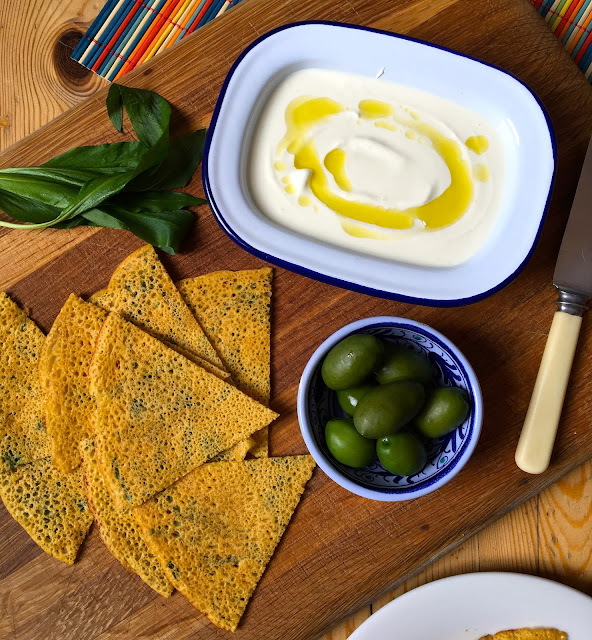 Perfect for weaning babies and children as an alternative to bread or crackers, it can be used to dip, scoop or just eat as it is. I make it quite often for my boys (who are now 5 and 1). 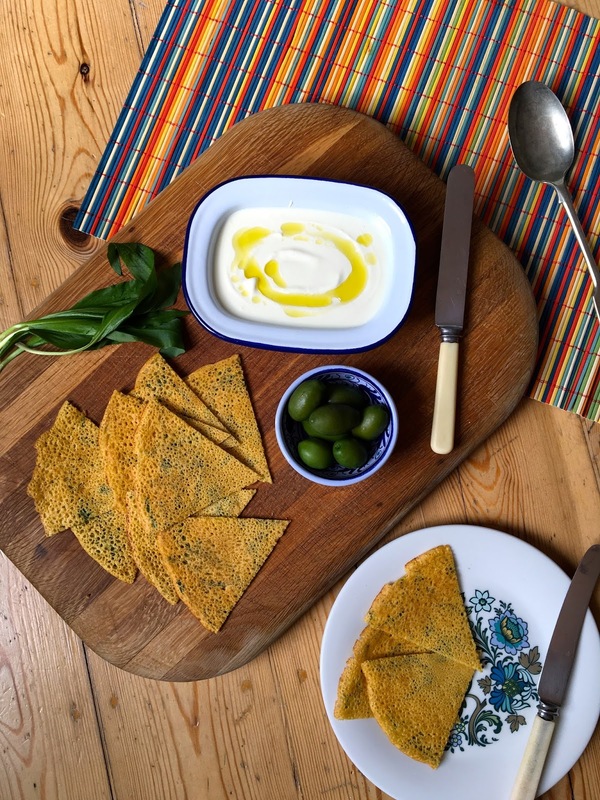 In this recipe, the wild garlic gives the socca a gentle background flavour which works so well with the creamy whipped feta. 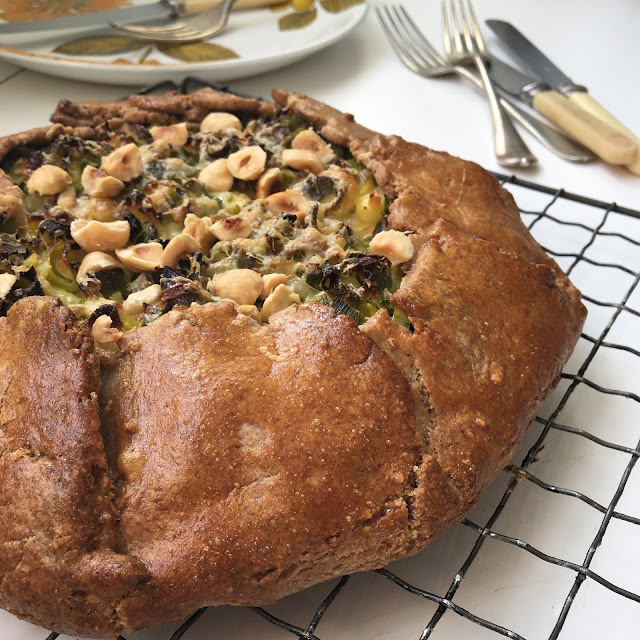 I like to serve this for family lunch with some olives and sun blush tomatoes, but it would work just as well for pre-dinner nibbles or as a starter. The lovely folk at Farmdrop are offering you £20 off a £40 shop if you would like to try them out for yourselves. All you have to do is place an order for £40 or more before the end of April and use the code REVOLUTIONGINGER at checkout to receive the discount. This offer is valid for one shop only until 30th April 2016. Begin by making the batter for the socca. Put the gram flour, salt (if using) and olive oil in a bowl and whisk in the cold water until you have a thin batter with no lumps. Put to one side. To make the whipped feta, break the feta into chunks, place in a food processor and blitz until broken down. Add the cream cheese, half of the greek yogurt, lemon juice and olive oil and continue to blitz until smooth, adding the rest of the yogurt if the mixture is a little too thick (I find that the consistency of cream cheese and greek yogurt can vary quite a bit depending on the brains you use, so for a firmer whipped feta to use as a dip, you may not need all of the yogurt). Keep the whipped feta covered in the fridge until ready to serve. When you are ready to make the socca, put a small frying pan over a medium heat. Stir the wild garlic into the socca batter. Put a little oil in the base of the frying pan (I do this by pouring about a tablespoon of oil into the frying pan, swirling it around and then pouring it into a little heatproof bowl. Then before frying each socca, I used a wad of kitchen roll to wipe the remaining oil around the base of the frying pan). Pour a ladle-full of batter into the frying pan and swirl around to cover the bottom, as you do when making a pancake. Fry for 2 minutes on each side, or until golden brown and beginning to crisp at the edges. They are ready to eat straight away, or can be made ahead and then put into the oven (180 C / 160 C fan) for 5 minutes to reheat. How much batter you will need depends on the size of your frying pan and how thick you would like your socca to be. I like to make them quite thin for this recipe so that my boys can spread them with the whipped feta and roll them up if they want to, but you may prefer a thicker, more robust socca to scoop the whipped feta up with. 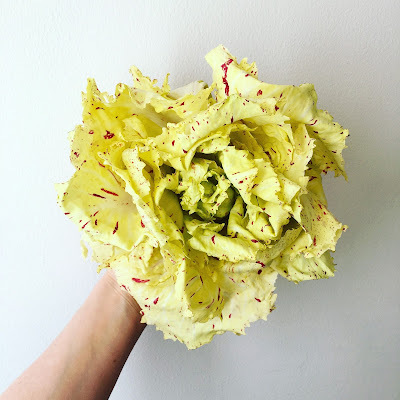 I received a voucher worth £50 from Farmdrop to test out their online shop.